Twilight Sector is a complete setting for Traveller, published by Terra/Sol Games. At its heart, the Twilight Sector is one among a multitude of possibilities that exists for the future of mankind. Add a thousand years, faster than light travel and a bubble of humanity spread across a thousand light years of space and you have the Twilight Sector. In more specific terms the Twilight Sector is a science fiction setting designed to be accessible to as many genres as possible. Everything from superhero, to horror, to mystery, exploration to politics, all fit organically into the setting and switching back and forth between the many possibilities is simple. It is a detailed setting which at the same time is open and accessible to all of these flavors of adventure. The Twilight Sector, like science fiction, isn’t meant to be viewed as a static thing. It is and will always be alive and dynamic. With a constantly evolving backdrop that will make a referees job as easy as possible. 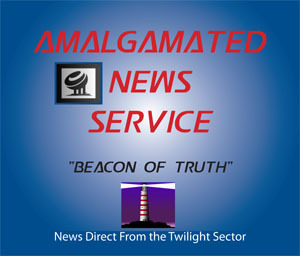 With developments like the Amalgamated News Service, which provides constantly updated news and information on the setting. Campaign support is also designed to make the referee’s job easier and keep players linked to the game between sessions. The Twilight Sector is a place where RPG players can make themselves at home! We started Terra/Sol Games with the idea that players play games to have fun. It’s our belief that the fun in any game is the game itself, interesting scenarios, detailed backdrops and engaging characters. Those are the things we think that make any game session fun. With the Twilight Sector setting we do our best to provide those key ingredients to make your games fun. Our slogan is, “Because the Campaigns the Thing”. What we mean by that is it may be a rules set or something else that draws you to role playing in the first place but it’s the game or campaign/setting that is the fun enabler and keeps you coming back. The Twilight Sector has many fathers in a literary sense. It’s first was, of course, the StarDrive Campaign Setting. 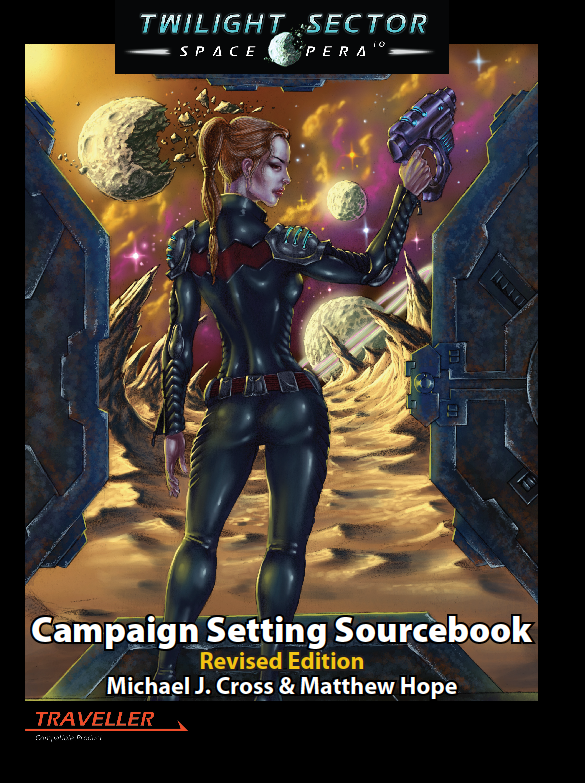 That’s the Campaign Setting Sourcebook thanks to Richard Baker and David Eckleberry the authors of the StarDrive setting. Beyond that there are a number of influences from science fiction. Larry Niven’s Known Space is a very strong influence, the entire cyberpunk sub-genre would find much that is familiar in the Twilight Sector. The outlines of ideas inspired by authors such as Peter F. Hamilton, John Varley, David Brin, Arthur C. Clarke, H.P. Lovecraft and a host more who I should have included and I’m sure I’ll remember the minute I send this in. The concepts of transhumanism, artificial intelligence and uplifting all feature heavily in the Twilight Sector. All of these various concepts and previous works have gone into creating the unique stew that is our setting. We call the Twilight Sector a space opera setting, but you can approach space opera in a number of ways and we try to do so from a scientific perspective. As much as is possible in any setting which postulates faster than light travel we attempt to tie ourselves firmly to real world science. So essentially the Twilight Sector is what we like to call a “Hard Space Opera”. To keep ourselves plausible we have to do quite a bit of research and keep up with real world science. We’re not scientists at Terra/Sol Games, but we are avid consumers of science news which probably makes us as dangerous as most science fiction authors! Art has played a key role in our setting from the beginning. It has provided visual cues for often complex ideas making them more accessible to our readers. We were lucky enough to stumble on some incredible artists in the beginning. Guys like Emel Akiah, MuYoung Kim and Mates Laurentiu. They have been largely responsible for creating a style that is uniquely Twilight Sector and this style has carried over to new artists that we’ve used as well. I immodestly believe that the quality of art in our products is as good as many of the largest companies in RPG publishing. As I hit upon in the description previously, the Twilight Sector is meant to accommodate any gaming genre. We even have our own, “setting within a setting” Netherell. It is a full on fantasy world but not divorced from our science fiction roots. I think it’s a clever twist we’ve used with Netherell to have our cake and eat it too. We want players and referees to be able to create any type of game they like and set it within the Twilight Sector setting. The thousand year distance and science fiction trappings only serve to heighten the experience of any type of game you choose to set here. Every product is different and unique, so to compare us in any but the most general terms to other products does not do justice to them or the Twilight Sector, but I’ll do it anyway and include why we might be comparable to those other products. Traveller’s OTU is one comparison that might be made and it is applicable, but only in the sense that both are large galaxy (or at least portions of one spiral arm) spanning settings tied together with a detailed history of what has come before. The StarDrive setting is another comparable setting because of our roots there. We are similar in that we have a history still connected to Earth (the OTU does as well but the setting is so far in the future there is no real connection to Earth’s history as we know it) and we have stellar nations competing with each other. Major points of divergence are, we have no aliens and we use many more science fiction elements like mutation and transhumanism. The final comparison would be to the great Larry Niven’s Known Space setting. I like to think we’re where Known Space would be had it been written in the last decade instead of having started out in the 60’s. I was at GenCon in 1997 and happened to stumble on a black book with a flying belt buckle on its cover. That was the preview edition of the Alternity rules. I also happened to meet David Eckelberry who was running a LARP with its roots in a setting he and Richard Baker were in the process of creating StarDrive. I got a handout for the LARP which gave me a bare boned description of the StarDrive setting. StarDrive wasn’t due out for a year or so and there’s nothing worse than a GM with time on his hands itching to run something. I knew that I wanted to create my own setting, but tie it to a published one so I’d have this great source of backstory and news events; perhaps that idea was the precursor to Amalgamated News! So off I went and created my own little piece of the galaxy. What that all lead to was an 11-year long campaign in a setting of my own creation, which I named the Twilight Sector. 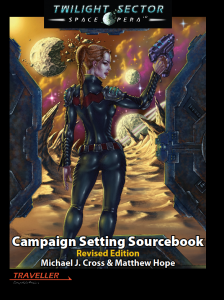 The campaign spawned literally notebooks worth of material much of which has now seen the light of day in products like the Campaign Setting Sourcebook and our mega campaign, Beyond the Open Door. Turning the campaign into a commercial campaign setting was not something I set out to do; it just sort of evolved. When the choice was made, I was confronted with a number of campaign decisions. I had the opportunity and frankly the requirement (I couldn’t use WoTC’s background for my own commercial product) with this new beginning to make design decisions to create a background that meshed perfectly with what I wanted to see in a setting. When it comes to settings, I’m a generalist. I don’t want to telegraph to my players what the campaign is going to be all about. I like to throw them curve balls and jump back and forth from one campaign theme to the next so they always feel like there is a great mystery to solve or crisis to be averted. A group that feels in-game pressure is a motivated group and is usually having fun. For that reason, I wanted to create a setting that would accommodate the widest possible number of genres and play styles possible. All, of course, wrapped up in a science fiction setting. One of my first and most far reaching design decisions was to not have extant aliens in the setting. I’ve seldom seem aliens done well in science fiction let alone in science fiction RPG settings. But even beyond that, by leaving out aliens we reserve their discovery for the players. A monumental event in human history would/will be the discovery of intelligent alien life. That is something we want to reserve for players and referees in the Twilight Sector. We know they’re out there, we’ve found some ruins and some artifacts but we’ve never met one yet. Another major design decision was to use a duplicate Earth as the initial centerpiece of the setting. This introduced a major mystery right away. The thought process behind using the duplicate Earth, other than the bonus mystery, is it provides a familiar place for the players to play in. If you tell a player they are going to Chicago or London, they know where those places are and familiarity is one of the keys to allow players to suspend disbelief, which is a key to any successful game session. Other design decisions regarded elements that would be central to the campaign. These include things like artificial intelligence, transhumanism, human mutation and uplifting of animals. With each decision however, we made an effort to keep the setting as open ended as possible. We want referees to be able to add their own touches and explore different themes the way they want to. For example, if you want to treat mutations as a minimal change to baseline humans, but emphasize the social unrest they have caused, all while exploring the mystery of why the rates of mutation have gotten so high, it would be no problem. On the other hand, if you want to run a full on supers campaign, you can do that too, with the added benefit that via technology it would be hard for your supers to find meaningful opponents. With our design decisions in the Twilight Sector setting, we’ve tried to walk a line where on the one side we provide a plethora of detail and substance for players. But on the other hand the setting is open and they have the opportunity to mold the game into what they want it to be. That’s what the Twilight Sector is and I hope you’ll check it out. A Universe of Adventure Awaits with the FREE Dominion Quickstart for Mindjammer Traveller! Prepare for a Universe of Adventure with Mindjammer for the Traveller RPG!